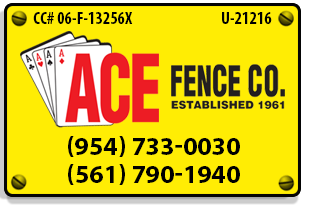 We at ACE FENCE CO. believe that nobody in South Florida will build you a higher quality fence than we will. Because of the confidence we have in our products and in our people, we provide you this exclusive written warranty. WOOD FENCE is covered by a LIMITED LIFETIME WARRANTY to be free from structural defects due to damage caused by fungal decay or termites. “ECONOMY” RESIDENTIAL CHAIN LINK FENCE is covered by a FIVE YEAR WARRANTY to be free from defects in materials or more than two percent of its surface area covered by red rust. “GOOD” RESIDENTIAL CHAIN LINK FENCE is covered by a TEN YEAR WARRANTY to be free from defects in materials or more than two percent of its surface area covered by red rust. “ASTM” RESIDENTIAL CHAIN LINK FENCE is covered by a TWELVE YEAR WARRANTY to be free from defects in materials or more than two percent of its surface area covered by red rust. “OLDE TIME” RESIDENTIAL CHAIN LINK FENCE is covered by a TEN YEAR WARRANTY to be free from defects in materials or more than two percent of its surface area covered by red rust. VINYL COATED RESIDENTIAL CHAIN LINK FENCE is covered by a SIXTEEN YEAR WARRANTY to be free from defects in materials or coating failure. ALUMINUM FENCE is covered by a LIMITED LIFETIME WARRANTY directly from the manufacturer that will be passed through to the purchaser. PVC or VINYL FENCE is covered by a LIMITED LIFETIME WARRANTY directly from the manufacturer that will be passed through to the purchaser. There are limitations. Please read them. We think they are reasonable. To have a warranty, fences must have an ACE FENCE CO. sign on them and the balance must have been paid when due. This warranty covers new fences installed by ACE FENCE CO. only and not repairs. After the first year, this warranty is for materials only, and ACE FENCE CO.’s sole obligation is limited to the replacement of defective parts or materials with the same or similar parts or materials. After the first year, removal and/or installation are not included, and ACE FENCE CO. is not responsible for these costs. This warranty does not cover personal injury, death, or any incidental damages of any kind. This warranty is for the original purchaser only and is not transferable. Any claim must be accompanied by the original contract for the purchase of that product. This warranty does not cover damage cause by misuse, abuse, or abnormal use; air pollutants; discoloration by sprinklers; acts of God, fire, flood, lightning or hurricanes; wood boards, stringers or posts that warp, check or crack or boards which rot due to contact with grass or ground; surface rust at welded points; and self-closing hardware. Ready to learn more about our Warranty? Click here to request a FREE Quote!